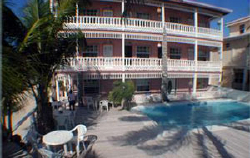 The Tides Beach Resort "Our Belize Vacation" - "Our Belize Vacation"
The Tides Beach Resort is a very comfortable, well-managed hotel, locally owned resort by Patojo and Sabrina Paz, local natives of San Pedro. 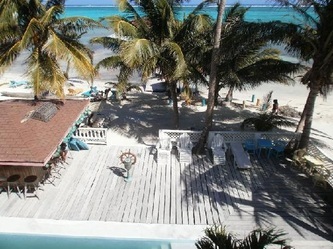 Patojo and Sabrina designed The Tides to maintain the beauty and architectural heritage of Ambergris Caye. The location is great -- quiet beachfront, but also just a 5 minute walk to San Pedro Town, making for very easy convenient access to local restaurants, bars and shops. The Tides is a unique trip for budget minded travelers where we match up a fine hotel in the town of San Pedro with the best guides on the island. You get the flight to the island, great lodging, the best guides but lunch and dinner are not included in these packages because of the plentiful supply of markets, bakeries and restaurants in town. After reading this page you may want some more details by using the links found up and to the right of this text, they will overlay a specific detail page. For more pictures try out our new photo gallery topics also on the right, a little further down the page. This proximity to markets and shops saves quite a bit of money. For example, Lisa and I like to grab something from the continental breakfast in the morning for breakfast along with some coffee. The night before I'll usually pick up something at the market for lunch like sandwiches and fruit and lots of water and stash it in the fridge in the room. ( The guide will have a cooler with him). For dinner we splurge and go out to one of the bars or restaurants in town , there are 6 or so that are well worth it. You can even head out to restaurants like Capricorn, Rendezvous Luna or Portofino on the north end of the island by using the water taxi service. It runs about $10-15 round trip. Even with the splurging for dinner we usually are well fed for about $25-35 USD a day per person. The trip begins in Belize City where you will board a small plane for your flight to the town of San Pedro on Ambergris Caye.This air fare is covered in all our packages. At the Airport you should get a taxi for the 10 blocks to the hotel. After checking in you have plenty of free time to explore the beach and the rest of the town. You will meet the manager of the tides ( if not the owners Sabrina and Potajo) and they make sure your stay is comfortable and your individual needs are met. You will usually leave for fishing around 7:30 or 8am. Tarpon usually require an early start, but weather, tides and species all play a factor in your departure time so your guide may suggest a later or earlier time if it provides better fishing. 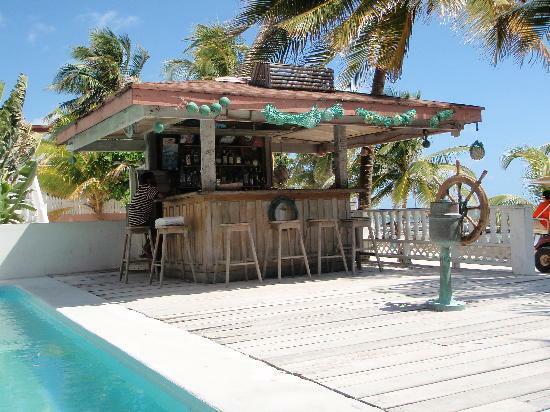 If diving is your reason for being, and you don't want to spend a ton of money, you couldn't do better than this beachfront hotel, owned by Patojo Paz, one of the island's most experienced dive masters, and his wife. The three-story wood-frame structure recalls a time before everyone built with reinforced concrete. Top picks here are the second- and third-floor oceanfront rooms, which have balconies overlooking the beach. 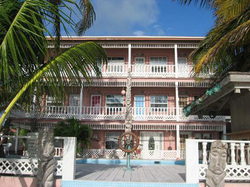 The hotel is at the north end of town, but you can walk along the beach to San Pedro's bars and restaurants. This is one of the island's better values. New beachfront suites have one to four bedrooms with kitchens.